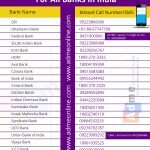 In this guide you will find all Indian Banks Missed Call Balance Enquiry Numbers. 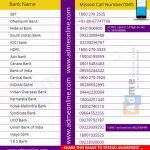 All major banks have launched ‘Missed Call Banking’ facility which is a simple and quick way to get Bank Account balance (or) mini-statement of account through your mobile phone. 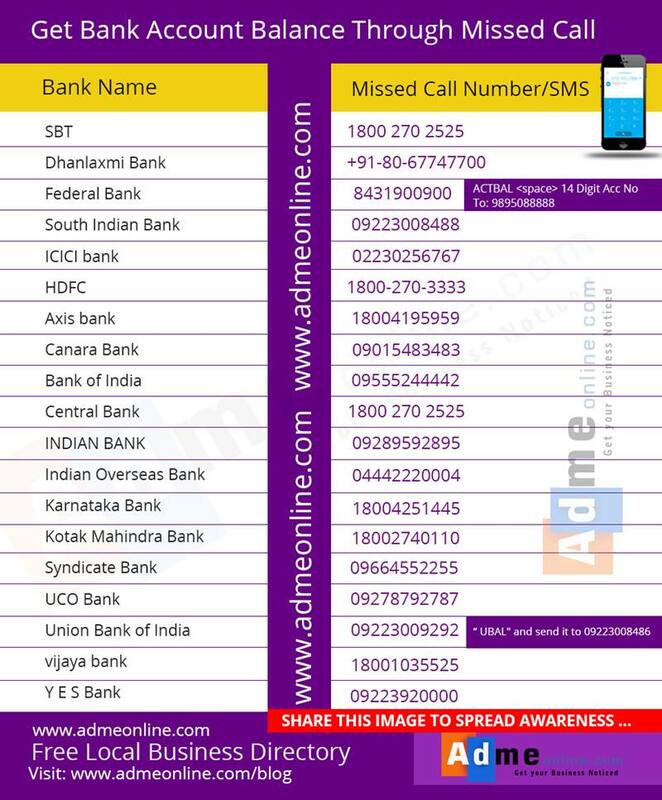 Each bank has its own dedicated Toll-free numbers. Bank customers can just give a missed call to the toll-free number and get their Bank Account Balance as SMS (text message). This facility is free of cost.See below how to get bank account balance through missed call in India. What is Missed Call Banking? 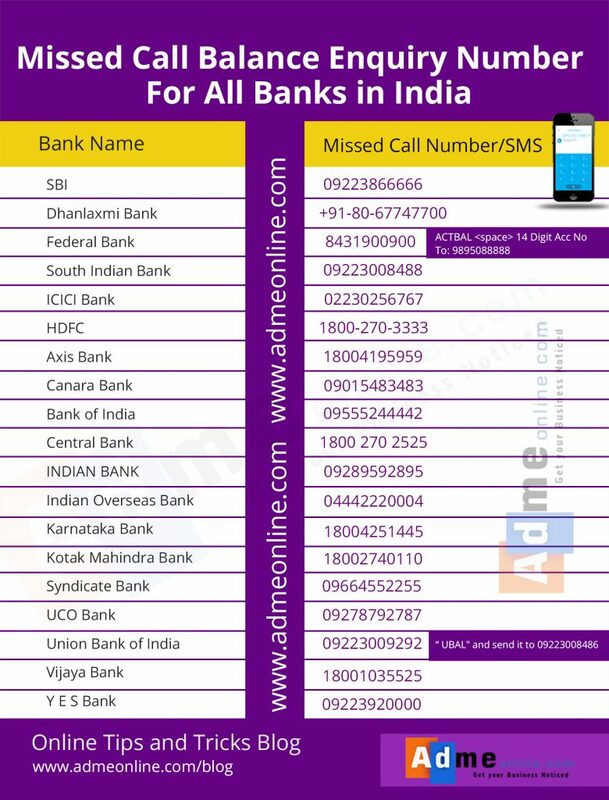 Missed call banking facility, as the name suggests, provides banking services if you give a missed call. These services include balance enquiry, mini statement, cheque book request, account statement request, email statement request and others. The services vary across banks. 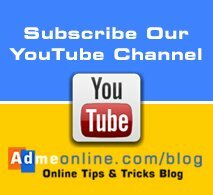 Please Subscribe Our YouTube Channel Click Here OR Click on the ‘Subscribe‘ button below. SBI Quick – MISSED CALL BANKING is a new service from the Bank which involves Banking by giving a Missed Call or sending an SMS with pre-defined keywords to pre-defined mobile numbers. 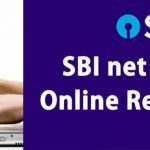 To enable SBI bank account balance checked by miss call features, you have to register for SBI quick service,This can be done by sending an SMS. For registration Send SMS To: 09223488888. Dhanlaxmi Bank introduces Missed Call facility for an instant and hassle free banking services to the customers. Give a Missed Call from your registered Mobile number to get instant SMS with your account(s) balances. Federal Bank recently introduced missed call balance enquiry service. To get Account Balance details, just give a missed call to the number. After few rings, call will get disconnected automatically. Within few minutes, the Bank will send Account Balance details to the registered mobile number. South Indian Bank customers, who have registered and linked their mobile number with Bank Account, may make use of this missed call balance enquiry service. 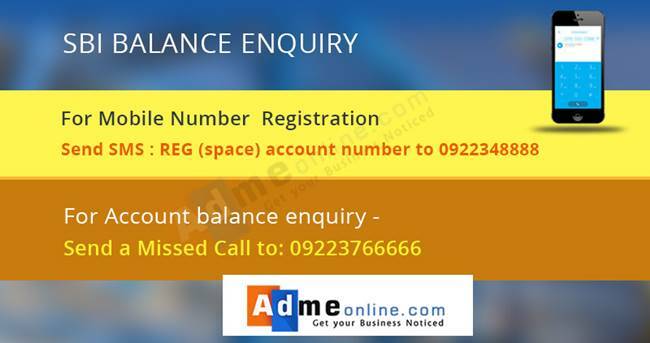 If you are a registered user dial the number. After few rings, the call will get disconnected automatically. The Bank will then send an SMS containing the Account Balance details to that mobile number shortly. ICICI bank is one of the leading privet sector bank.To know your ICICI bank account balance call from your registered number Once connected, ring will be made and after a few rings, the call will be disconnected automatically. So, a customer will not be charged at all, for making use of this missed call service. Access your bank account, make banking transactions, monitor your accounts and fixed deposits on your mobile. HDFC Bank is the only bank to offer the SMS Banking service in English and Hindi. Axis bank is one of the most popular privet sector bank. 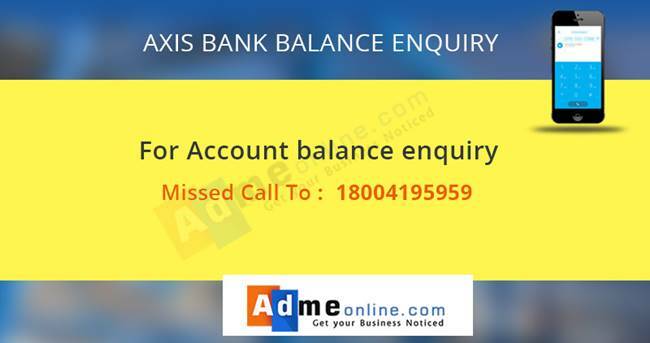 If you have axis bank account you can get your account balance by giving miss call on 18004195959. 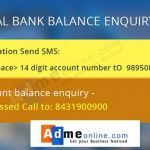 You have get account balance details through SMS. Dial 18004196969 to get mini statement through SMS. The phone number is- 09015483483. It is valid all over India. A Canara Bank account holder has to just dial the above mentioned number. The call will automatically be disconnected and an SMS containing the account balance will be shortly sent to his/her mobile number by Canara Bank. Another well known bank with numerous customers.The account balance enquiry number is 09015135135. Call will be disconnected after first ring and balance details will be send through message. Bank OF India Balance enquiry number : 09015135135. It is a well-known nationalized bank offering customer friendly service. The missed call balance enquiry number for CBI bank is 09555244442 just give a ring to this toll free number and system will message account balance information to account holder number. 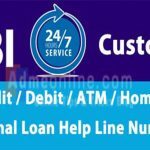 f you are an Indian Bank customer and your mobile number is registered with the Bank, you may make use of this service. Dial the number- 09289592895 to get balance information. 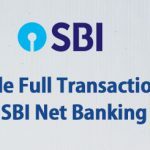 The call will get disconnected automatically and the Bank will send an SMS containing the Account Balance details to the registered mobile number of the customer. 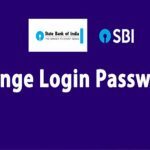 Indian Overseas Bank customers will first have to make sure that their numbers are registered to make use of this service, Call the number- 04442220004. The call will get disconnected after after a few rings. 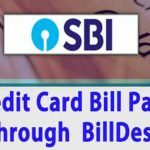 The Bank will then send an SMS containing the Customer’s Account Balance details to the registered mobile number. Karnataka Bank users can use 18004251445 toll free numbers to give missed call to getting account balance details and missed call to 18004251446 to get mini statement. Kotak Mahindra Bank’s SMS Banking service enables you to access your bank account, investment account and demat account on your mobile phone. 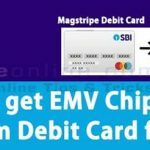 It is quick and easy, available to you 24X7 and it’s absolutely FREE!. 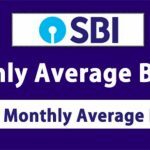 The account balance checking number is- 18002740110. The missed call process is to be done on this number using your registered mobile number. A mobile phone can make your banking experience more friendly and enjoyable by allowing you to stay connected with your account at any time. Balance enquiry number of Syndicate Bank is- 09664552255. 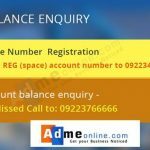 Give missed call to this number from registered mobile number. UCO bank is well known for its services also provide balance enquiry on giving miss call on 09278792787 and get details by SMS on your register mobile number. 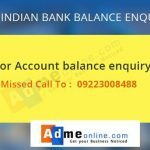 Union Bank of India can also provides missed call service to get there bank customer’s account balance. To get balance information missed call to 09223009292 through account registered number. Missed call balance enquiry number for Vijaya Bank is 18001035525. Simply give missed call from your register mobile number and know your bank balance instantly. The account balance checking number of Yes Bank is- 09223920000 Give missed call to this number and get account balance details sent to your registered mobile number via an SMS! 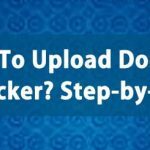 Please Checkout our How to Video Tutorials in YouTube. You can also Visit Our Blog and Subscribe to our Newsletter to first know when we publish a new Post.